Hugo goes to India to discover a temple’s history. He gets more than he bargained for, from being lost to seeing elephants take revenge. 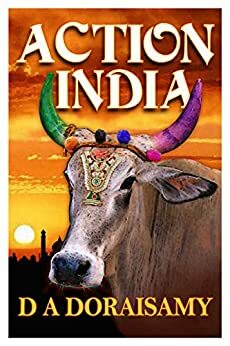 I find the descriptions of life in India through Hugo's eyes so realistic and authentic... truly reflects the fact that the author actually lived there. Again a great sense of momentum here and some beautiful turns of phrase. I like this book as much as the first and it is truly a perfect story to encourage young people to read. You are transported to this ancient culture so quickly and completely it seems as if it permeates the very air that you breathe. Loved the droll observations by the characters.... so Aussie and so real. A fun read. This author is a great story teller whose genuine tone warms my 9 yo's heart, stimulate his mind and give him a thrill. I love the very well rendered and believable feelings and attitudes of young Hugo. All five books, Action India, Action Africa, Action Down Under, Action Australia and Action in the Land of the Long White Cloud, are all lovely engaging books.